The National Football League (NFL) of American football is a multibillion-dollar industry which dominates the sports airwaves and press headlines from the first preseason game each August until the Super Bowl each February. Do you know the intersection between an anesthesiologist and the NFL? At each and every NFL game there must be one Airway Management Physician on the sideline. This Airway Management Physician is most commonly an anesthesiologist or an emergency medicine physician. My anesthesia company had the contract for the San Francisco 49ers Airway Management Physician during the 2005-2006 season, and I worked in this role. It was a fascinating job, and in this column I’ll fill you in on the experience. Why must every NFL game have an Airway Management Physician on the field? Football is a violent sport played by young men of unprecedented speed and size. When these men collide there is always the risk of injury. The NFL Physicians Society (NFLPS) mandates a 27-person game-day medical staff. Each sideline includes 2 orthopedists, 2 primary care physicians, 4 athletic trainers, 1 unaffiliated neurotrauma consultant, and 1 chiropractor. In addition, the Stadium Medical Team includes 1 dentist, 1 ophthalmologist, 1 Airway Management Physician, 2 Emergency Medical Technicians, 2 independent athletic trainers, 1 radiology technician, and 1 visiting team medical liaison. During the game, common football injuries to the knee, ankle, foot, shoulder, elbow, or hand are matters for the team orthopedic specialists, the athletic trainers, and perhaps the chiropractor. Injuries to the head activate a concussion protocol in which the neurological examination is carried out with the aid of the neurotrauma consultant. The Airway Management Physician is present in case of a severe medical complication. This would include a cardiac arrest, a respiratory arrest, a cervical spine injury, or an airway injury which impairs breathing. In these situations the acute medical management must follow the standard sequence of Airway, Breathing, and Circulation. The player’s airway must be open and secured prior to any effective breathing or cardiac care. If the player’s airway is not open, the Airway Management Physician is responsible for placing a breathing tube through the player’s mouth into his windpipe so oxygen can be effectively ventilated in and out of the lungs. The absence of oxygen to a patient’s brain for 3-5 minutes can cause permanent brain damage. The NFL game day Airway Management Physician will be an experienced anesthesiologist or emergency room doctor, because these are the two specialties which deal with the placement of urgent breathing tubes in hospital operating rooms, emergency rooms, or intensive care units. The urgent placement of an airway tube is called a Rapid Sequence Intubation, or RSI. Anesthesiologists routinely use RSI technique to place a breathing tube into a patient’s windpipe prior to emergency surgery. Emergency surgery patients are always classified as “full stomach” patients, meaning that they have not fasted for the required 8 hours prior to elective surgery. Patients who have full stomachs are at risk for vomiting their stomach contents into their lungs. This can be a lethal complication. In my 30+-year career as an anesthesia attending, I’ve placed thousands of RSI breathing tubes prior to surgeries. Emergency room physicians place RSI breathing tubes for various causes including trauma, cardiac arrests, or respiratory arrests. To perform a RSI, the anesthesiologist or emergency room doctor will administer a hypnotic drug (such as propofol or ketamine) if the patient is conscious, followed by a paralyzing drug (such as succinylcholine or rocuronium). At the same time, a medical colleague (a surgeon or a nurse) will press down on the cricoid cartilage at the anterior aspect of the patient’s voice box. This is called a Sellick maneuver or cricoid pressure, and this serves to compress cricoid cartilage (which circles the windpipe) downward against the esophagus to reduce the chance of stomach contents regurgitating into the mouth and/or lungs. Next the anesthesiologist or emergency room doctor inserts a lighted instrument called a laryngoscope into the patient’s mouth, to identify and visualize the opening to the trachea or windpipe. The physician then inserts a hollow plastic breathing tube called an endotracheal tube (ET tube) into the windpipe. The ET tube has an inflatable balloon near its tip. Once the ET tube is in place, the physician inflates the balloon to secure a tight fit within the windpipe. Oxygen can then be ventilated in and out of the tube via a breathing bag. A RSI is a stressful acute medical procedure in which there is little room or time for error. If the physician has difficulty inserting the breathing tube and the patient has no oxygen entry, the patient can suffer anoxic brain damage within 3-5 minutes. In a hospital setting, even when the physician has all the necessary equipment at his or her fingertips, a RSI can be a harrowing experience. Trying to execute a RSI on the 50-yard-line of a football field, on a 300-pound athlete with a thick neck and who is wearing bulky shoulder pads and perhaps a football helmet, under national television audience scrutiny, would be stressful to the extreme. No NFL player to date has ever had a cardiac or respiratory arrest on the football field during a game. On August 20th, 2005, San Francisco 49ers offensive lineman Thomas Herrion collapsed and died the locker room after a preseason game in Denver. Per a personal account from a physician present in the locker room at the time, the team had gathered around and closed their eyes to say the Lord’s Prayer, and during that prayer they heard a loud thump. They opened their eyes to see Herrion lying on the ground unconscious and seizing. No anesthesiologist or emergency room physician was present. The physicians who were present attempted to revive Herrion. He was transported to St. Anthony’s Central Hospital where he was pronounced dead. Per coroner Amy Martin, a forensic pathologist in Denver, Herrion weighed 335 pounds and was 6 feet 3 inches tall. His autopsy was positive for significant blockage of the right coronary artery, and his cause of death was listed as heart disease. His blood tests were negative for any steroids or performance-enhancing drugs. He entered the game for about 20 plays near the end of the game, and he appeared to be in normal physical condition prior to entering the locker room. In the weeks following Herrion’s death, my anesthesia company was hired to be the Airway Management Physicians for the remainder of that 49ers season. I was the Airway Management Physician for the September 25, 2005 game between the 49ers and the Dallas Cowboys at Candlestick Park in San Francisco. Prior to the game we dressed in team medical polo shirts in the team locker room with the other members of the medical team. Some physicians were engaged in pregame consultations with the trainers regarding players with injuries or ailments. Before the game I joined a group of physicians who walked to the opposing sideline to introduce ourselves to members of the Cowboys medical team. Just prior to kickoff, when the 49ers ran out of their locker room onto the field, we physicians walked just behind them. The soundtrack to our stadium entrance was the same roaring ovation that the sellout crowd gave their football heroes—it was an unforgettable experience. I was given a small, 10 X 4 X 4-inch pouch labeled “RSI equipment.” Inside were the necessary items: the laryngoscope, the syringes, and the drugs necessary for a routine Rapid Sequence Intubation. I must confess that for multiple reasons I was praying I would not intubating a 335-pound lineman with the contents of that pouch on that day. Along with the other members of the medical team, I was instructed to remain between the 30-yard-line and the goal line on either end of the field, and not to enter the team bench area between the 30-yard-lines. I was given a red hat to wear so I could be easily identified in an emergency situation. I remained in the immediate vicinity of the other team doctors so I was ready for a team approach should an emergency occur. I watched the game vigilantly so I would be ready should an emergency occur. There were no cardiac arrests or fractured cervical spines, and my services were not required on that Sunday. Following that season the 49ers contracted with the full-time faculty of Stanford Medical Center to be their Airway Management Physicians, and I never had the opportunity to reprise the experience of that one 49ers-Dallas game. The sheer size of the linemen makes their airways potentially difficult to manage. I performed anesthetics on multiple San Francisco 49ers players for orthopedic surgeries over 15 years time. Their cardiovascular fitness was never in question, but their bulk was striking. A Body Mass Index (BMI) table states that a 335 pound, 6 foot 3 inch patient has a BMI=41. A BMI over 40 is defined as Morbid Obesity, and this is always a significant anesthesia concern. Morbid Obesity carries a risk classification of American Society of Anesthesiologists Class 3, which is defined as “a patient with a severe medical disease which is currently stable.” A professional athlete is more healthy than an inactive couch potato fan who watches the NFL on television, but nonetheless anesthetizing gigantic men requires skill and entails risk. A second lasting impression is that the RSI pouch I was given in 2005 would be woefully inadequate in 2017. An essential tool to intubate a 300-pound giant wearing football gear is a portable video laryngoscope, such as the McGrath 5: This is a handheld tool with a camera on one end and a video screen on the other. The video laryngoscope allows the physician to see around the curves of a large man’s tongue and jaw, and to visualize the opening to the windpipe without moving or extending the cervical spine (which in some football injuries must be suspected of having an unstable fracture). I’m certain that modern day RSI equipment at NFL games includes not only a portable videoscope but also a larger array of breathing tubes and airway management tools such as you’d find in a difficult airway cart in an operating room or an emergency room. 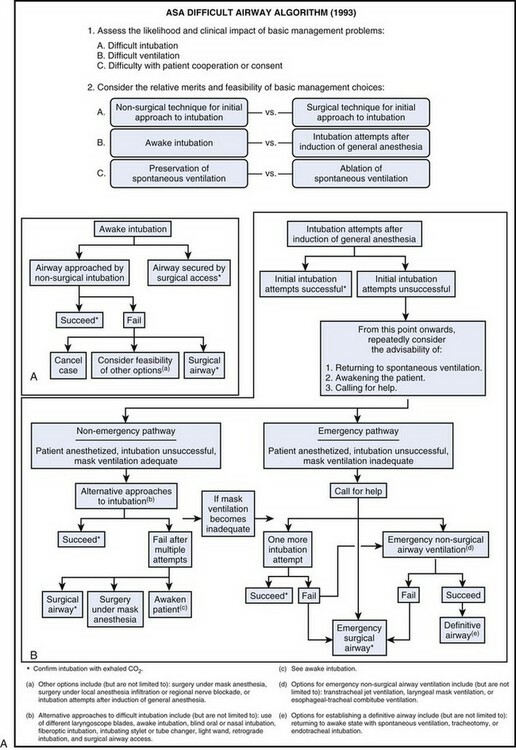 The American Society of Anesthesiologists Difficult Airway Algorithm references the optimal approach to any airway difficulty, and an airway emergency on an NFL playing field would be best managed per this Algorithm. My third profound recollection is how cool it felt to be on the sideline for an NFL game, and how memorable it was to witness the spectacle up close. My own football skills never advanced past 3-on-3 touch football, but I’m a fan, and I’ll always remember my adventure as a member of the medical team for America’s number one sports attraction. Posted in ANESTHESIA PATIENT QUESTIONS BLOG, CLINICAL CASES FOR ANESTHESIA PROFESSIONALS.Tagged anesthesia blog, McGrath Series 5, NFL Airway Management Physician, NFL Anesthesiologist on Sideline, NFL linemen-morbid obesity, NFL Sidelines Medical Team, rapid sequence intubation, RIchard Novak MD, RIck Novak MD, RSI, Thomas Herrion Death NFL Locker Room, training, video laryngoscope.